Hari Batti's Green Light Dhaba: Green Maths: for Teachers, Parents, Citizens! Like many parents in Delhi, I'm thinking a lot about school these days, since my own children are going back after a Commonwealth Games-shortened summer holiday. So this week, I'm focusing on things that relate to education. On Tuesday, I told you how to write a green poem. Today, I'm writing about green mathematics. For those of you wondering what maths has to do with the environment, let me just say that I am convinced that the world economy, as it is presently organized, is unsustainable, which means we need to figure out a way to do things differently or a lot of bad things are going to happen very soon. In order to figure out how to avoid as many of those bad things as possible, we are going to need a lot of people who understand numbers. And I'm not just talking about rocket scientists, I'm also talking also about every day people who vote. We all need to understand maths, or we can't really understand the world we live in. Suggestion Number 1: Make it real. A car covers a distance of 89.1 km in 2.2 hours. What is the average distance covered by it in one hour? Average speed is something we like to talk about in the real world. But when we do, we typically use estimation and approximation. When I worked this problem in my head, I thought, "OK, Hari, if it took you two hours to cover 90 km, you'd be doing 45 km per hour; if it took you three hours, you'd be doing 30 km per hour. But 2.2 hours is much closer to 2 than 3, so the answer must be closer to 45 than 30...I'd say it's about 40 km per hour." Then I got out a calculator and found the only answer my son said would be acceptable to his teacher: 40.5 km per hour. But the calculator would be forbidden, of course. For what it's worth, this word problem is followed by no fewer than 35 sums involving division of decimals, all which are designed to teach students to be efficient at the given paper and pencil algorithm, but none of which ask for any new thinking beyond that. It is good for people to understand how to solve problems with paper and pencil--but if we are drilling students so they can do that faster and faster, we are wasting our time! The reality is that we spend a lot of time teaching children to do things that are not as important as they once were, and we do this at the expense of teaching them to think about things that are important! It won't be easy to change the textbooks, but teachers and parents can do what they can to talk to children about real numbers in the real world, whenever possible. Suggestion Number 2: Ask them why? Children should understand that explaining their thinking is just part of what you do when you do maths. Understanding and explaining our own thinking, whether correct or not, is extraordinarily good for learning. In a classroom setting, if an answer is correct and a student explains how she solved it, other students will almost certainly benefit from hearing that there may be many ways to solve the same problem! You know this instinctively: some people can follow verbal directions easily; some need to see a map. In maths, my eldest child likes numbers and equations while my youngest needs visual models, but both are capable of reaching the desired outcome: understanding! By the way, we can often learn a great deal by hearing a faulty strategy explained--as long as we aren't ridiculed for them, we really can learn from our mistakes! Some teachers complain that there is no time for such talk. That is true if we continue to value endless drill above all else; and that would be a fine approach if our goal were simply to train shopkeepers who can do without calculators. But if we want to teach our children to be deep mathematical thinkers, we need to understand that there are places where less is more. Suggestion Number 3: Go beyond the numbers! Anyone who loves to read knows that there is more to understanding literature than simply retelling the plot. Good readers make inferences about character motivation and consider the large lessons and themes that emerge from a piece of literature. The same should be true in maths: it is important to wrestle with the ideas that go with or spring from the exact or estimated solutions to the problems we face. Yes, the numbers are important, but they rarely exist without a context. Sanjay, his brother Subeer and their mother are traveling the 9 km from school to home by autorickshaw. Auto fares have just gone up in Delhi, but most meters have not been adjusted to reflect the change. An autowallah offers to take them home for 70 rupees. He says he's no good at figuring and doesn't have the new rate sheet yet. Mother knows the new rate is 19 rupees for the first 2 kilometers, then 6.5 rupees for each additional km, but she is in a hurry and agrees. On the ride home, she asks the boys if she was foolish. Sanjay says yes. Subir says no. Who is right? "Sanjay is right because the true fare should only be 64.5 rupees. I put aside the first two kilometers, then I added up the remaining 7 kilometers in pairs (2 km costs 13 rupees because 6.5+6.5=13). Six km's came to 13+13+13=39. Then I added 6.5 for the 7th km and it came to 45.5. 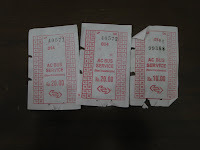 After that, I added in the 19 rupees for the fist two km's and found the answer: 64.5." 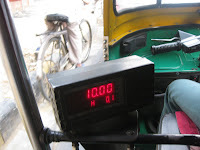 "Subeer is right because the autowallah is asking for just a little more than the metered fare. I rounded the 19 rupees for the first 2km to 20, then I rounded 6.5 to 7 and multiplied that by the 7 remaining km's. 20+49=69. Yes, it's a little higher that the real rate, due to rounding, but driving an auto is hard work, and this man is being reasonable. Generous is a better word than foolish to describe what the mother did!" "Subeer is right. His mother has probably been paying 70 rupees for that ride for months now, anyway, since auto drivers have been refusing to go by meter!" Subeer, Sanjay and their mother are returning from school. Yesterday, they paid 70 rupees to travel the same route by auto. A red AC bus stops and the mother says, "Get on boys, today we'll take the bus." The conductor says the mother and Sanjay have to give 20 rupees each; Subeer only has to give 10 since he is smaller. There is nowhere to sit, but the AC is working well and the bus travels quickly, thanks to the middle lane of the BRT. On the 10 minute walk home from the bus stop, the mother asks the boys if she had done the right thing taking the bus. Sanjay says, yes, Subeer says no! Who is right? "Sanjay is right because the mother saved 20 rupees, when you compare the bus fare she paid with the auto fare she paid yesterday." 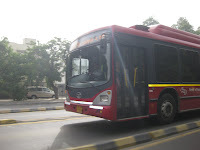 "Sanjay is right because AC buses are cool and interesting to ride in! Also, the mother saved 20 rupees, compared with the auto fare she paid the day before." "Sanjay is right because the mother saved money and she helped reduce pollution and traffic by going by bus." "Subeer is right because the mother only saved 20 rupees, but they had to walk home AND they had to ride standing--no fun!" "Subeer is right because the AC bus is much too expensive. 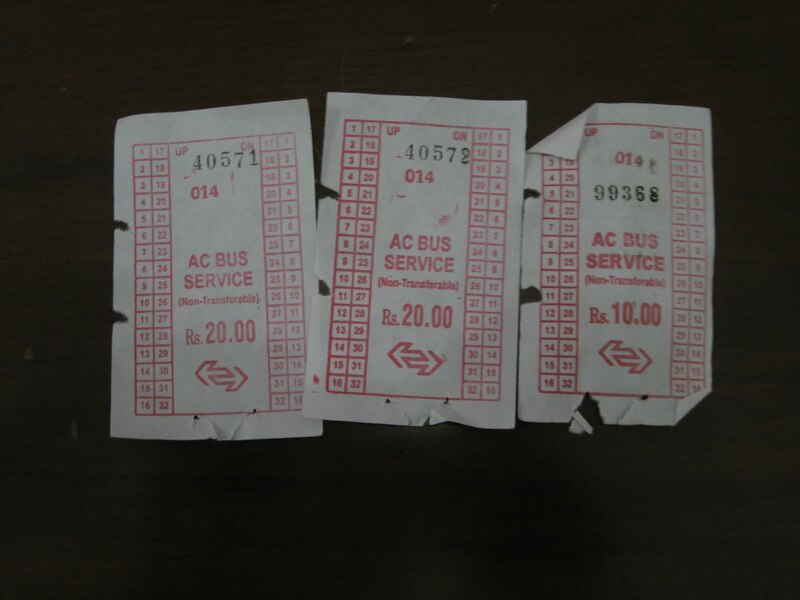 They should have waited for a non-AC bus, which would have only charged them 10+10+5=25 rupees! Subeer, Sanjay and their mother are traveling by bus. Sanjay asks, "If the people on this bus had to travel in some other way, how many more motor vehicles would be on the road?" After a bit of counting and estimating, they agree that there are about 50 people traveling on their bus. Mother says she thinks that without this bus, 35 more vehicles would be on the road. Subeer says he thinks it would be closer to 20. Who is right? "Mother is right because most people live too far from their jobs to walk. They would have to travel by some other vehicle!" "Mother is right because I see a lot of cars traveling with only one person." "Subeer is correct because even two wheelers often carry two or more people. I'd guess that an average of two people would go per additional vehicle and 10 would walk or take the bus. 20X2+10=50. Subeer is right." "They are both wrong. Most people who ride the bus do so because they cannot afford a private vehicle. Nearly all the people would travel on foot, by metro, or by cycle. A few would travel by private van. I'd estimate at most 5 new vehicles." "There is not enough information to make a reasonable decision. You would need to do a survey of bus riders to find out!" Subeer, Sanjay and their mother are traveling by auto along Aurobindo Marg. Subeer complains about the litter on the road. 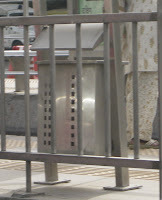 Mother says, "Do you think more trash cans would help?" 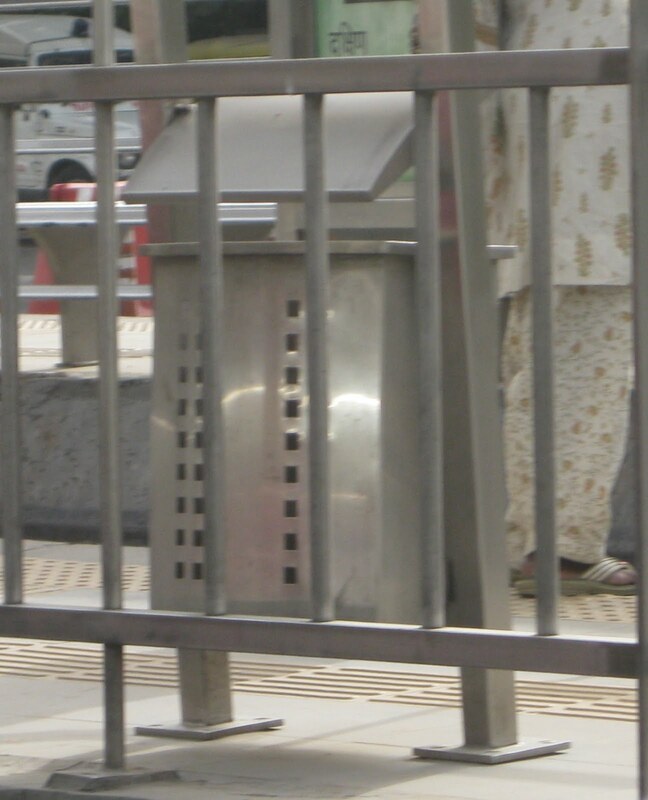 Measuring the distance by the auto's meter, they count 5 trash cans over the next 2 km, all of them at bus stops." Subeer says more trash cans would help. Sanjay says more trash cans would make no difference. Who is right? Please supply your reasonable answer in your comment below! @Space Bar--That link is wonderful! What I love about it is that it allows you to use algebra (two equations, two variables, negative numbers, etc.) OR you can use common sense. In this way, it is accessible to people at very different levels of mathematics. What is interesting is that often the students who know how to do more "difficult math" forget how to use their common sense! You won't believe it, but there are senators in the US who want to ban referring to global warming in school because "it scares the kids"
@Bhagwad--Not sure which is scarier; the climate change or the senators who don't want to talk about it! I'll follow that link for sure; thanks for sending it.